This item is not packaged by itself. It must be purchased in conjunction with one of our RETSEL hand mills. 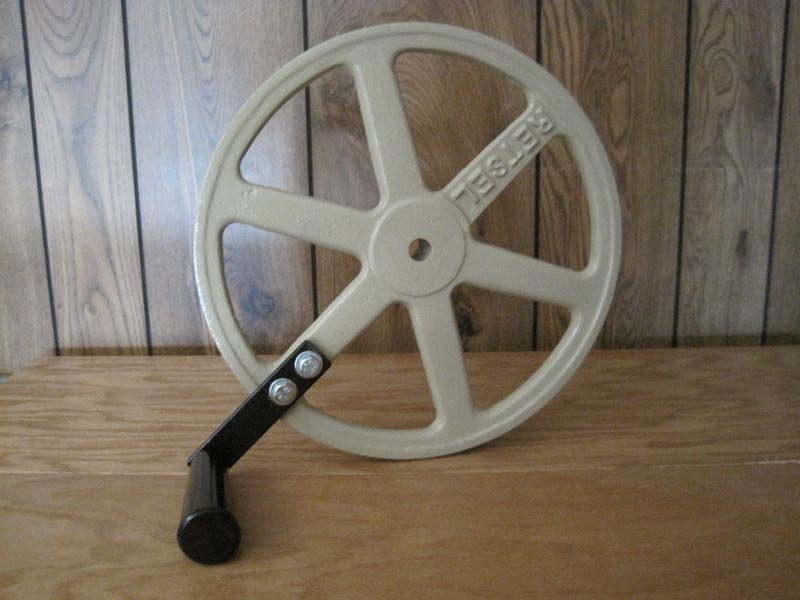 HEAVY DUTY, AMERICAN MADE, CAST IRON FLY WHEEL, 12 INCH, SINGLE GROOVE TO ACCOMMODATE STANDARD V BELT. THIS FLY WHEEL CANNOT BE PURCHASED SEPARATELY AND IS MACHINED TO FIT ONLY RETSEL HAND MILLS. THIS QUALITY MACHINED, POWDER COATED AND COMPUTER BALANCED FLYWHEEL IS MADE EXCLUSIVELY IN OUR FACTORY. THIS FLYWHEEL HAS A 5 INCH LONG EXTENSION BAR ( ALSO KNOWN AS POWER BAR) ATTACHED TO IT, THUS GIVING YOU EVEN MORE TURNING POWER. IT HAS A LONG BLACK PHENOLIC HANDLE GRIP (BOLT, NUT AND WASHERS INCLUDED). APPROXIMATELY 20% LESS TORQUE IS REQUIRED WHEN THE USER ATTACHES THE FLY WHEEL TO THEIR MILL. THE BLACK HANDLE GRIP ON THE FLY WHEEL MUST BE REMOVED PRIOR OF MOTORIZATION. We carry this flywheel in several different shaft diameters from 1/2 to 3/4 inch diameter. Most mills on the market use the 5/8 diameter. Please e-mail us if you have any questions. THIS FLYWHEEL CAN BE USED SEPARATELY OR WITH CONJUNCTION OF A MOTORIZING KIT. IF YOU PURCHASE THIS FLYWHEEL TOGETHER WITH THE MILL IN YOUR INITIAL ORDER, THE MANUAL HANDLE WILL NOT BE SHIPPED WITH THE MILL. INSTRUCTIONS INCLUDED.